The announcement by the Australian Labor Party (“the ALP”) of its policy shift to stop the cash rebate of franked dividends was predictable … and is alarming. It was predictable because the cash rebates attached to franking could be accessed to an excessive extent by the “mega wealthy”. While they acted within the law, even these ultra-high net worth individuals would probably acknowledge that the franking cash rebates on their large equity portfolios (well above what is required for a pension scheme) was inequitable. “A franking credit on dividends received after 1 July 2000 is a refundable tax credit. It is a form of tax paid, which can reduce a taxpayer's total tax liability, and any excess is refunded. For example, an individual with income below the tax-free threshold ($18,200 since 2011/12) pays no tax at all and can get the franking credits back in full as cash, after a tax return is lodged. 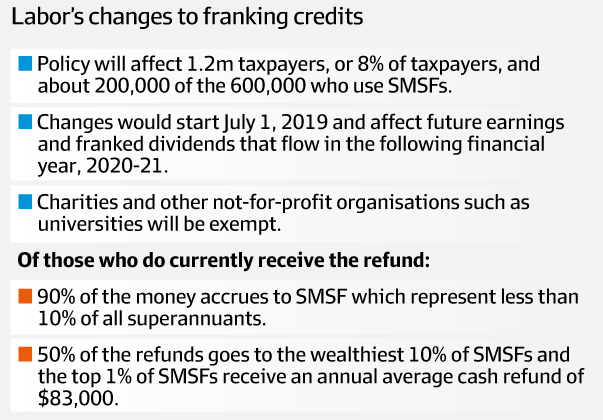 The following release by the ALP notes that about 7,000 SMSF (1% of the total) on average receive $83,000 in cash refunds from franking credits. To receive that amount of cash credit, those funds would need to receive $276,000 in franked dividends. On the assumption of a 4% franked dividend yield, those funds would need to have at least $6.9 million in Australian listed shares. The ALP is justifying a tax change targeting a very few - that has broad and far reaching consequences for the many. Its policy changes are arguably far beyond that which is necessary. If the ALP is ostensibly targeting the “mega wealthy”, who have used their pension funds as tax minimisation schemes, then that appears to be a legitimate but belated policy shift. The ALP supported the introduction of cash franked rebates (when in Opposition in 2000), and when they were in Government (2007 -2013), they made no attempt to adjust the franking system. 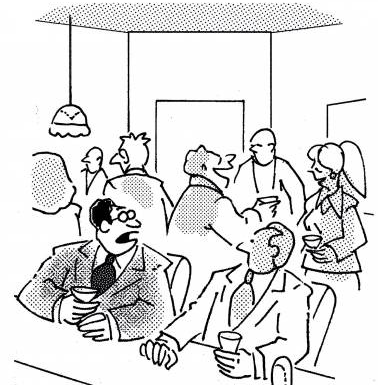 Therefore, many typical SMSFs have been managed based on a bi-partisan and enduring approach to franking. This week’s announcement is consequently alarming and will create concerns for many retirees. The proposed sledgehammer adjustment to the franking rebates will affect all pension fund returns (not just SMSFs). It is unwelcome and poorly structured given the low yield world that confronts all investors (see Australian bond yields below). The proposed ALP policy change will lower the returns for many average SMSFs. These SMSFs, with (say) $1.6 million in pension assets per member (as legislated in the 2017 Federal Budget) are not the funds of the mega wealthy. We suspect that an actuary (adopting the proposed ALP franking cash adjustment on equities) could now question whether the $1.6 million pension cap would be sufficient for a 70-year-old pensioner with a longevity outlook of 18 years. To explain the effect on cash returns of pension funds, consider the example of a “balanced” fund with about 40% invested in Australian listed equities. The $640,000 of equities on average generates a 4% franked yield ($25,600). The franking credit attached to these dividends is approximately $11,000 or 0.68% of the fund. In other words, the franking credit adds 0.68% to the total fund return - this is significant cash flow supporting pension pay out rates that approximate 6% of the fund. In the above example, the “balanced” pension fund, if the franking credit is changed, will need to generate $11,000 of cash returns from some other asset class to maintain its cash earnings rate. At the same 4% cash income return (that is, 1% above TDs and 2% above ten-year bond yields), the fund will require an extra $265,000 in capital. The ALP has not even considered this consequence. 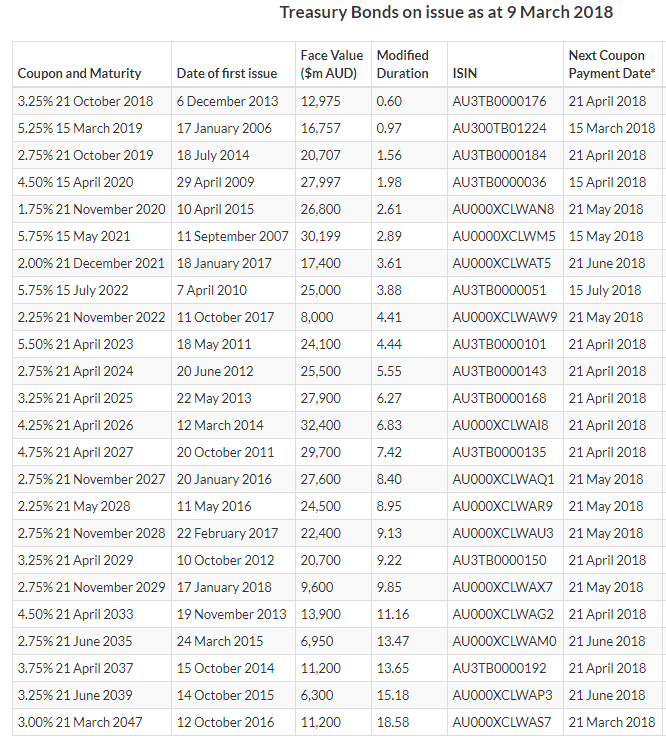 The cash flow problem for balanced funds is exemplified in the next table, which highlights the current yields of Australian Commonwealth bonds on issue. In the past, it was said that the allocation to bonds (supposedly “low risk” assets) should rise as a beneficiary of a pension fund aged. A pithy “rule of thumb” was that the percentage asset allocation of a fund to bonds should correspond with the age of the member. For instance, a 60-year-old would have 60% of their pension fund in bonds, and an 80-year-old would have 80%. Of course, in that bygone era, bond yields were significantly higher than inflation and therefore generated a reasonable risk-free return that could match pension liabilities. Today, pension funds must look elsewhere for yield and the equity market, with franking, fills the breach. To some extent, the changes announced in last year’s budget to limit SMSF pension fund assets (and tax-free status) to $1.6 million were designed to restrict tax benefits flowing to “overfunded” funds and the extremely wealthy. A super balance above $1.6 million now attracts an accumulation tax of 15% on fund income. The ALP is arguing that those legislated changes did not go far enough; but their proposals will erode the returns of pension funds and upset the balanced asset allocation approach increasingly adopted by retirees. While there is still debate as to whether the $1.6 million pension fund limit is reasonable (given it is not age adjusted), we can use it as a basis to design a more sensible alternative to the ALP sledgehammer policy. In our view, the claim for franking credit rebates should be based upon a “reasonableness test”. Based on the government pension rate, the tax-free threshold of $18,000, the average 6% pension payout on a $1.6 million fund and a notional allocation of 30% to 40% to Australian equities in a balanced pension fund, we think that a $12,000 franking rebate limit could be introduced. This limit could be claimed by each member in pension mode in a SMSF and therefore supplement the income generated from non-equity and lower risk investments. This rebate would allow a member to have $1 million in Australian equities (assuming a 4% fully franked yield), before the rebate is fully utilised. As noted above, we suspect that the ALP policy makers have not properly considered or understood the full consequences of a cash rebate change. The biggest issue is the asset allocation design of a SMSF to meet the progressive needs of pension payments with a risk/return analysis. If the policy were adopted, we perceive two consequences and risks. 2. We wonder whether the hybrid yield market could become an unintended victim and suffer fallout. Most hybrids include in their terms a “gross-up” adjustment in the event of franking becoming unavailable or a tax change occurring. In this case, the franking stays attached to a hybrid distribution, but the cash franking rebate is lost. Our concern is whether the hybrid securities have contemplated such a change. While it is good that taxation is now on the political agenda, it is paramount that both sides of parliament agree that a proper universal review of tax is needed … not a piecemeal approach. Once again, the ALP has proposed policy in a vacuum, and it reminds us of their attack on salary packaging in the run up to the 2015 election. Excellent article and great work in translating the deliberately complex political language into understandable English. Apart from Super funds there are 10000's of people not that far above the pension limits who will lose their annual few thousand Franking credit rebate. These people are clearly not wealthy - just put away a bit extra. Seems biased when you consider that part pensioners can keep their refunds. Smells of buying votes. Labor dearly wants to keep the growing band of pensioners in their pocket. Perhaps the $12000 refund limit you suggest should apply to all whether Super fund or individual. We have become over time a truly 'bottom up economy'. We throw money at the lower income base of our economy. This over time has created a perpetual QE because these recipients are more likely to spend than save thus keeping cash registers ticking over. Problem is to maintain the bottom up economy we need to keep finding ways to redistribute wealth. The money from the mining boom has come and gone - so whose pockets do we pick now?? Good article. Exempting pensioners/part pensioners is clearly a vote winning exercise and appears biased. There are many not far outside the assets and income pension limits who will be effected. Pensioners are big winners here. Bank shares say fully franked grossed up dividend in excess of 8% and deeming for pension purposes at only 3.75% with the first 50k or so exempt. Also add in the concessions value of power, registration, medical etc, etc. which are the working mans equivalent of taxable fringe benefits they are doing ok. In fact there is no way the Government would be able to say how much a pensioners packaged up wage/benefit is. If you could not tell your shareholders/partners that you would likely lose your job before you finished saying "I don't have a clue". Anyway its likely going to promote schemes to get people on the part pension some how to take advantage. I bet there are plenty of people who would go so far as to divorce to split assets as those franking credits on top of non taxable concessions and a few pension $ suddenly become very enticing.